No matter where we live, to one degree or another, air pollution poses serious risks to our health. New, ongoing research explains how airborne pollutants affect how your skin looks, feels, and even how it ages. Some research suggests that pollution is just as bad for skin as unprotected sun exposure. The need to protect skin from environmental pollution—not just from UV light—is more important now than ever before, and the right skincare is where that protection begins. 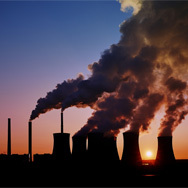 Air pollution refers to the gases or particles released into the air by human activities, such as auto exhaust, manufacturing processes, chemical and petroleum refineries, cigarette smoke, and many others. Most gaseous airborne pollutants don’t penetrate skin at first; instead, they trigger a cascade of damage on skin’s surface, and, eventually, that damage makes it easier for the pollutants to get in to your body. One type of nongaseous pollutant, known as small particulate matter, is small enough to actually get into pores, where it becomes trapped and causes ongoing damage. (These pollutants are often referred to as nanoparticles because they’re so tiny.) And simply washing your face isn’t enough to remove these pollution particles once they get into the pores. Although air pollution is obviously worse in big cities, living in rural areas doesn’t mean you’re free from risk. All forms of pollution move through the atmosphere, water, and can settle in soil on the ground, so you can see how it can easily travel beyond the borders of industrialized cities. All forms of pollution cause free-radical damage to skin, with smog being an especially harmful source. Left unchecked, this damage leads to the breakdown and deterioration of everything skin needs to look healthy and prevent signs of aging. Small airborne pollutants get stuck in pores, causing acne-like breakouts (often called chemical- or pollution-induced acne) and triggering damage in the deeper layers of skin, right where wrinkles and most discolorations form. As mentioned above, when skin’s surface breaks down, many types of airborne pollutants are small enough to get into the body through the impaired skin. That’s why keeping skin’s surface intact and healthy is vitally important for its health and appearance. Of course, breathing remains the most direct route for air pollution to get into the body. You can help reduce this damage by not smoking and by eating a superfood-rich diet full of antioxidants. The same is true for skin: There are very important steps you can take to limit environmental damage to your skin. Truth in beauty: You can’t completely protect skin from the visible effects of pollution. It’s simply too pervasive to stop altogether. What you can do is shield skin as much as possible from airborne pollutants and the effects they can trigger. How? Use skincare products filled to the brim with anti-pollution ingredients that interrupt the cascade of damage. Look for anti-pollution skin care products formulated with antioxidants that interrupt the process of pollution’s effects on skin, but it takes more than antioxidants. Your pollution-fighting products should also include potent soothing ingredients that neutralize the damage air pollutants cause and that replenish the ingredients needed to fortify skin’s surface. It’s also more important than ever to use leave-on AHA or BHA exfoliants because they help dislodge the pollutants that get trapped in the pores. Skin-brightening products are also exceptionally helpful because pollution has clearly been shown to discolor and darken skin, no matter your ethnicity or amount of sun exposure. Is Blue Light a Pollutant? Although technically not a pollutant, daily blue light exposure is a serious problem. The issue is not so much from the environment, it’s from our digital devices. Whereas environmental blue light from the sun is far away and diffused, the blue light from your cell phone, tablet, or computer brings blue light within inches of your face. It turns out this daily up-close exposure is exceedingly damaging, especially for the eyes—we’re talking potential blindness here! Antioxidants, particularly those from plant pigments—for example, xanthophylls and grape polyphenols—can help protect skin from the damage by blue light, but it’s better to set your devices to yellow light (commonly known as night mode). Problem solved—if only the problem of air pollution was as quick to fix!